Located in West Sussex, 1st Clear Flow Limited provides specialist blocked drain clearance, drainage, plumbing, heating, ground works and maintenance work to this area and the surrounding locations. These main areas include Worthing, Shoreham, Portslade, Hove, Brighton, Littlehampton, Storrington, Steyning, Bognor Regis, Horsham and Crawley. If you live in one of these areas and you have a blocked drain, plumbing issue, problems with your boiler or any kind of maintenance issue in your home or business, you need an expert. You need 1st Clear Flow Limited, and we can help. East Sussex – Brighton, Hove, Eastbourne, Seaford, Newhaven, Lewes, Battle, Alfriston, Crowborough, Chailey, Ditchling, Forest Row, Hailsham, Heathfield, Peacehaven, Pevensey, Polegate, Ringmer, Saltdean, Rottingdean, Woodingdean, Uckfield, Falmer, Portslade. We do cover the whole of Sussex, so if your location is not listed above please do not hesitate to call us! we’ll be more than happy to come out to you. Our close by location means that we can keep response times low and ensure you get the service that you need as quickly as possible. We are able to manage both emergency repairs and extensive work to any home or business in the areas that we cover. If you are unsure whether we cater to your area, don’t hesitate to contact us today. One of our helpful advisors is on call ready and able to answer all of your questions. We will do everything we can to help you or recommend a company if you are not in the area covered by our team of experts. We handle a wide variety of jobs in the surrounding areas of Sussex including, plumbing, drain maintenance, and heating repair. If you have a problem in your home or business, you don’t want to wait around. You need to get it fixed as soon as possible by a team that you can trust. Our local service is ready and able to deal with any problems that you might be facing. We deal with all the problems that you could encounter in homes and buildings around Sussex. Jobs both great and small can be fixed by our team. Perhaps you have a clogged drain in your home that you simply can’t fix yourself? Or maybe you have discovered a problem with your heating system? You might even just want an upgrade installed by a team that you can count on for an expert service. Well, you have come to the right place. We have provided these services in areas such as Brighton and Crawley for years. As we have gained experienced we have developed a firm reputation for a great quality of service in the regions that we cover. When you hire our team, you can count on them working on your property until the job is complete. We won’t rest until you are one hundred percent satisfied with the result. Our full list of services that we offer include ​Blocked Drains, Clearing Toilets and Sinks, Drain Lining, Root Cutting, CCTV Surveys, Groundworks, Water Mains, Plumbing, Heating, Power Flushing, Boiler Services and Repairs.​ We are one of the only local businesses with the technology and capability to arrange CCTV surveys. When you use our company, you’ll be getting a team that is ahead of the curve. For any queries or questions make sure that you give us a call. 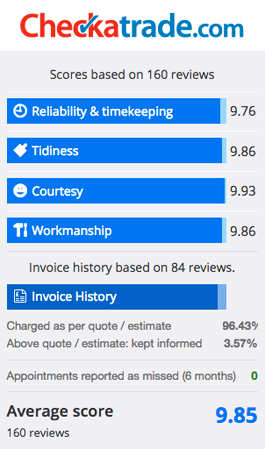 If you’re completing work on your home or in your business, quality is always going to be your main concern. We aim to provide the best possible service on the market in all the areas we cover. Trust in quality, trust in 1st Clear Flow Limited.